Now, there will be no more traffic jams as the flying motorcycle is going to become a reality. First flying motorcycle named The Speeder is revealed by JetPack Aviation. The company is taking pre-orders for The Speeder that can fly at the height of 15,000 feet for around 20 minutes. In addition, it can also achieve the speed of 240 km/hr (150 mph). The flying motorcycle will be powered by 4 turbojet engines and will come with vertical take-off and landing (VTOL) capabilities. 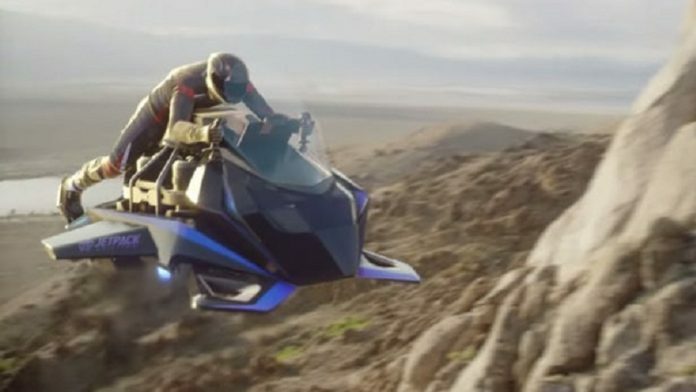 It will be a self-stabilizing motorcycle with the fly-by-wire control system has the capacity of producing a thrust of 705 lbs to carry 105 kg airframe and a pilot of up to 109 kg. It is a super luxurious flying motorcycle with the price tag of $380,000 and can be reserved at $10,000. It allows 10 to 22 minutes in air to the pilot depending upon his weight and altitude. However, it will run on diesel or kerosene. According to Jetpack Aviation, it is developing 2 versions under the Recreational and Ultralight categories. The experimental version will be available for use in USA and will need the pilot’s license for the operation. The Speeder can be controlled by the hand controls with several features including 12-inch touch screen navigation panel and a 2 way aviation radio system for air-to-air and air-to-ground communications.